Question 1 What is sublimation. Question 4 Give few examples of substances that undergoes sublimation ? Question 5 Why naphthalene balls kept in stored clothes in our homes disappear over a period of time ? Question 6 How does applying pressure help in the liquefaction of a gas ? Question 7 What is the effect of pressure on change in state of matter? Question 8 What is solid carbon dioxide? Question 9 Why solid carbon dioxide is called dry ice ? The Changing of a solid directly into vapours on heating,and of vapours into solid on cooling is called as sublimation. The solid substance which undergoes sublimation is called sublime. 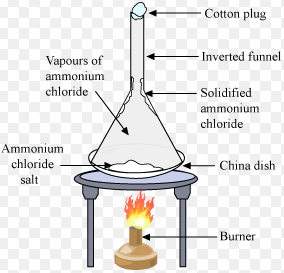 The solid obtained by cooling the vapours of the solid called a sublimate. The physical state of matter can be changed by increasing or decreasing the pressure.When a high pressure is applied to a gas,it gets compressed and when we lower its temperature,it gets liquified.Gases can be liquified by compression and cooling. I’m more than happy to uncover this site. I want to to thank you for ones time for this particularly wonderful read!! I definitely savored every part of it and I have you saved as a favorite to check out new stuff in your website. I found it good package fr learning and teaching as well. V well illustrated diagrams. Thank you so much Jasmeet for your wonderful comments. this weblog, thanks admin with this website. Good article! We are linking to the particularly great article on our website.